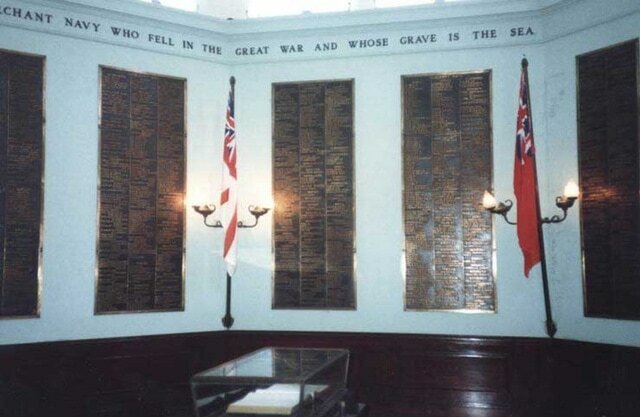 The names of the dead are recorded on eight panels in the memorial hall of the Indian Sailors' Home, and the memorial may be visited by obtaining the key from the Secretary of the Indian Sailors' Home. The main road leading to the Port Area is P.D. Mello Road which runs to the "Gateway of India". The entrance to the Sailors Home is on Thana Street. THE BOMBAY MEMORIALS. The three Memorials of the Royal Navy at Portsmouth, Plymouth and Chatham and the Memorial of the Merchant Navy at Tower Hill record the names of those European sailors who met their death in combatant service, or at the hands of the enemy, and whose graves are not known. There remain, however, the sailors of Asiatic or African birth who took the same risks and met the same fate, and for these men two other Memorials at two great Eastern ports have been erected. The names of the Chinese sailors are erected at Hong Kong; the Indian, Adenese and East African sailors are commemorated at Bombay, and with them are associated those Indian dead of the Royal Indian Marine who fell in the Great War and whose graves are in Eastern waters. The Bombay 1914-1918 Memorial commemorates more than 2,000 sailors who died in the First World War and have no other grave than the sea. A tablet erected in Bombay (St. Thomas) Cathedral records the names of Officers and Warrant Officers of the Royal Indian Marine who fell in the War, this also forms a Memorial to the five who have no known grave and whose names are given separately under the heading of the Bombay (St. Thomas) Cathedral Memorial.